Navigating up shallow creeks, we sought evidence of Colonial occupation. Flint shards offered us clues to early Native Americans having inhabited the area, while handfuls of shotgun shell casings told the story of the site having been frequented during this century. The lack of Colonial era relics demanded that we shift our search to other locations. There's something about bodies of water that has always drawn men to their banks. It makes no difference, either the time or the place-parties of Indians returning from their summer hunting grounds... British regulars halting in mid-march for a break and refreshment... Civil War soldiers guarding a train crossing, stopping to fill a canteen... the remnants and relics of their passing are always left in the wake. 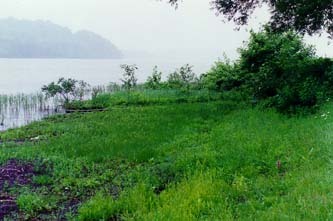 Often these sites are difficult to locate when attempting to find them from the land, but they are far more accessible and noticeable when viewed from the water. With this idea in mind, we started looking for something which would be a lot faster and more stable than our canoes. Both Gene and I had several ideas of the type of boat for which we would be looking. Easily towed, lightweight, sturdy, and capable of carrying equipment for a three-man team-those were our chief priorities. We weren't looking for "pretty"... functional and durable, with a draft shallow enough to reach the headwaters of small creeks, would suit us just fine and meet all of our relic hunting needs. 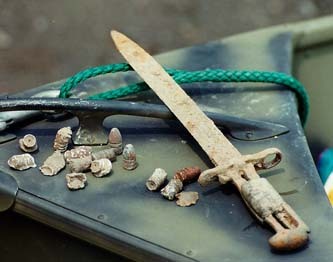 A modern bayonet was the initial recovery on the rocky summit, but it was later followed by numbers of spent Minie balls which peppered the thin soil of the slope. Early spring found us bailing out an aluminum boat which had been sitting on the edge of a field for the last several years. Once the thick layer of muck and dead leaves had been scraped from the inside of the hull and the rotting wooden seats had been torn out, we saw the potential that lay beneath. By the beginning of summer, freshly sprayed and sitting on a refurbished trailer, she was ready for the initial relic hunt. Continual channel dredging over the last century had altered the shoreline of the river to a considerable degree. Islands had been formed with the dredged material, and entire bays had been filled in. We decided that the best strategy for searching for areas to hunt would be to locate sections of the shore which had remained unaltered over the years, and primarily those where rocky heights and cliffs ran down to the water's edge. As the boat floated free of the trailer, we already had a couple of sites in mind. The tide was running in, dictating that our first site should be the point of high ground which was situated on a narrow, turtle-choked creek bordering the river. From past experiences we knew the site to have been frequented by prehistoric Native Americans, and we wondered if perhaps its occupation had extended into the Trade Era, or if Colonials had used the site in later years. The small lakeside point of land saw occupancy by a varied group of people, ranging from prehistoric Indians to soldiers of the French and Indian War. With each shovelful of soil pieces of the past would come to light. After two hours of being surrounded by swarms of mosquitoes, tearing spider-web masks from our faces, and digging handfuls of brass shotgun shell casings, we decided to shove off and head south to a high crest of rocky cliffs which had produced some early coins when it was first hunted over a decade ago. Pulling the boat up a rocky shingle and tying the anchor line to a stunted pine which grew from the cliff face, we began our ascent to the heights above the river. Fully 60' above the river's surface, we began running our patterns along the length of the crest. Strangely enough, the first target I dug from the site was a bayonet... a bayonet which was manufactured almost 200 years after one which I would have desired to dig! It was an interesting oddity, probably lost by a camper sometime during the last 50 years. We continued with our search, hoping to find far earlier pieces of history. I was just beginning to dig a plug on a sloping section of brushy ground when I saw Gene coming toward me, holding a battered piece of lead between his thumb and index finger. "A Minie ball," he said, passing it across for me to examine. I mentioned that the target I was in the process of digging was probably lead as well, and as Gene watched I pulled a matching ball from the bottom of the hole. During the course of the next two hours we would recover one Minie ball after another from the face of that slope. From the crest of the hill to the very edge of the cliff, the thin layer of soil was literally peppered with spent Minie balls! How had these projectiles found their way to that particular spot? Looking out from the slope there was over a thousand yards of open water facing us. It seemed unlikely that they would have been fired from the opposite shore, and even if they had been, what was the target at which they were being fired? Had they been fired by some passing boat as some type of Civil War era marine drill? We we're left with a number of nagging questions and too few answers. I sensed that if we were to continue our search along the base of the cliff at low tide, the muddy beach would probably produce dozens more flattened balls... but no more answers as to their origin. We had stumbled upon some historical mini-drama which had never been recorded in the books! 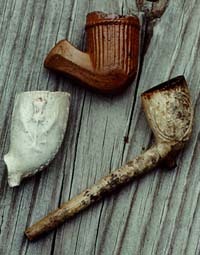 As the soil fell through the mesh of the sifter, early non-metallic relics, such as these 18th century clay pipes, were added to Keith's collection. The past is all encompassing... it is a long and multi-faceted train of people, events and experiences, most of which have been left unrecorded and undocumented. It should not surprise us when we stumble across such sites or when we recover relics which are inexplicable and unexplainable. Research only allows us to view the small portion of documented history... a history which only represents a minuscule percentage of the entire human experience. Hence, as relic hunters, we often find it difficult or impossible to illuminate those dark corners of the past. We are instead left holding two things... a relic, and a bagful of questions. It was the quest for answers that led Keith to a closer examination of his lakeside camp. 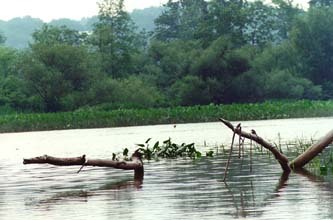 The lapping wavelets of the lake would continually loosen the soil, exposing flint shards, arrow points, and the occasional clay pipe stem. Planting shrubs often resulted in the unearthing of both historic and prehistoric artifacts. With each spadeful of soil, the resulting dig took on more the aspect of an archaeological rather than a horticultural experience. 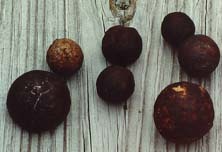 These pieces of iron grapeshot were fired into the embankment during some unrecorded engagement. Who fired them, and which group was the target of the assault, will probably forever remain one of history's mysteries! As Keith described it, "Every time I had to dig a hole on my property, I would sift the soil to see what interesting things it might contain." Along with buckets of worked flint, he was able to recover a wide variety of perfect arrow points dating back to some of the earliest Indian occupations on the lake... and like any ideal point of land on the water's edge, it was used repeatedly by various groups for thousands of years. Indian pipes and spearpoints... clay pipes from Glasgow and Colonial buttons... Native American pottery and English porcelain... musketballs and shoe buckle fragments... all were found in the bottom of the sifter once the soil had fallen through. In one section of the property, an area only yards from the lake's shore, Keith recovered a number of similar and interesting finds... over a half-dozen rounds of grapeshot which had, for some reason, been fired into the bank. "When I first saw them in the sifter, I thought they were curiously formed stones, but when I picked them up and felt their weight, I knew they weren't natural and were manmade." A couple of weeks later, after a trip to a museum, Keith was able to identify this interesting cluster of finds from his property. "It made me wonder just who was being fired upon," Keith pondered. "Was it the French firing on a band of Rangers they may had spied camping on the edge of the lake? Was it the English firing on a group of American rebels during the Revolutionary War?" 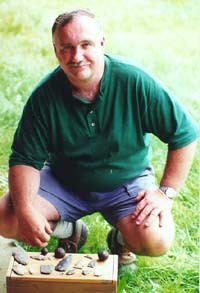 In addition to relics of Colonial occupation, Keith found evidence of early Native American inhabitants in the form of spear and arrow points on his property. This perfect lakeside site was obviously enjoyed by a wide range of people for thousands of years! Perhaps someday, in some dark corner of a lonely archive or in the bottom of some attic-stored Colonial chest, a faded and mouse-nibbled diary might reveal some answers to Keith's questions. In the meantime, we're just a bunch of relic hunters, seekers of the past, older students who come to history's table with an appetite for understanding and a wealth of questions. If those river and lake waters were only gifted with speech, the stories they would be able to tell... the answers they would be able to reveal... the songs of heroes and knaves they would sing!